For home purchase transactions, the Guarantee Date is the later of 30 days from the date we receive your signed early disclosures following application or the contract closing date. For refinance transactions, the Guarantee Date is 30 days from the date we receive your signed early disclosures following application. The borrower must provide Academy Bank with a copy of the original purchase contract that specifies a closing date and provide all required documentation within three days of submitting a complete loan application. The borrower provides Academy Bank with any additional required information/documentation within the time frame indicated on any Notice of Incompleteness or Commitment Letter. For purchase loans, the Guarantee includes only transactions that have a written contract between a buyer and seller for the purchase of residential real estate consisting of a one-to-four family unit dwelling (including condominiums). For purchase loans, if the property is a foreclosure then the seller's written approval must be executed prior to taking the application. For purchase loans, if the property is a short sale, the current lienholders(s) need to provide written approval of the short payoff(s) at time of application. Should you qualify to receive a $500 payment, the funds will be applied as a credit at closing. 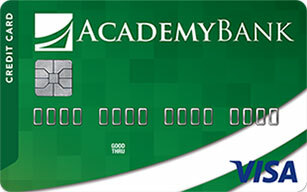 You must close with Academy Bank in order to receive the guarantee funds. This guarantee does not apply to Home Equity Lines of Credit or loans that require subordination of a second lien. The borrower changes loan products or terms. Applicable law or investor requirements impose a required waiting period prior to closing and that waiting period prohibits us from closing by your contract closing date. The closing is delayed due to borrower's actions, omissions or delays, or is due to those of an unaffiliated third party. The closing is delayed due to the seller's failure to close by the contract closing date or to perform as required under the contract or to satisfy conditions of the loan approval. The borrower does not specify a closing date in the original purchase contract (except contracts for new construction). Closing is not able to occur due to inclement weather, a natural disaster, catastrophic event or other general public emergency beyond Academy Bank's control. The borrower's application or loan documentation contains fraudulent information or material misrepresentations. The Guarantee is not assignable or transferrable and we reserve the right to withdraw, terminate, or amend this Guarantee at any time without notice except for eligible purchase or refinance transactions submitted prior to our withdrawal, termination or amendment. Loans subject to credit approval. Fees apply including fees for appraisal and property insurance. Limited time offer.